It was something that hovered in the back of our minds. Stretching our legs in Kathmandu led us to the top of Shiva Puri, a mountain on the north side of the sprawling metropolis. High up on the ridge, looking further north, true Himalayan giants would beckon. Rather than turn around and head back down into the city toward the smog, congestion, and poverty – what would it be like to just keep walking north? Across the undulating hills, valleys, mountains and ridges until we could kiss the slopes of Langtang? 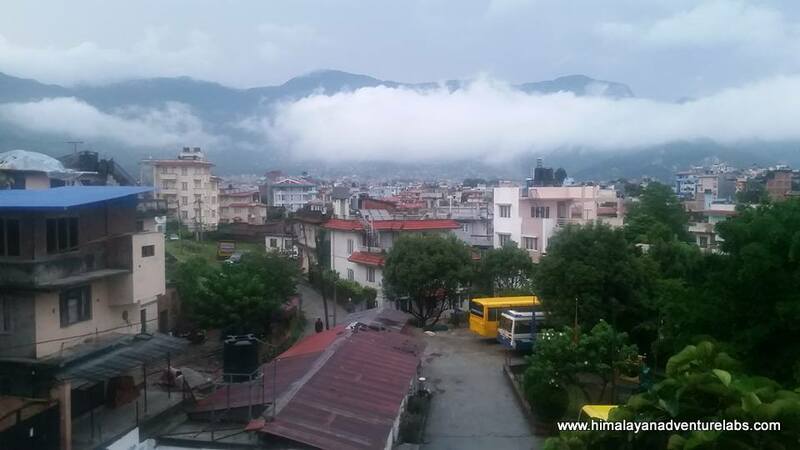 And that is how one early morning in late September we found ourselves walking and half running through the northern neighborhoods of Kathmandu up steeper and steeper paths leading to the top of Shiva Puri. Our packs hung from our shoulders. 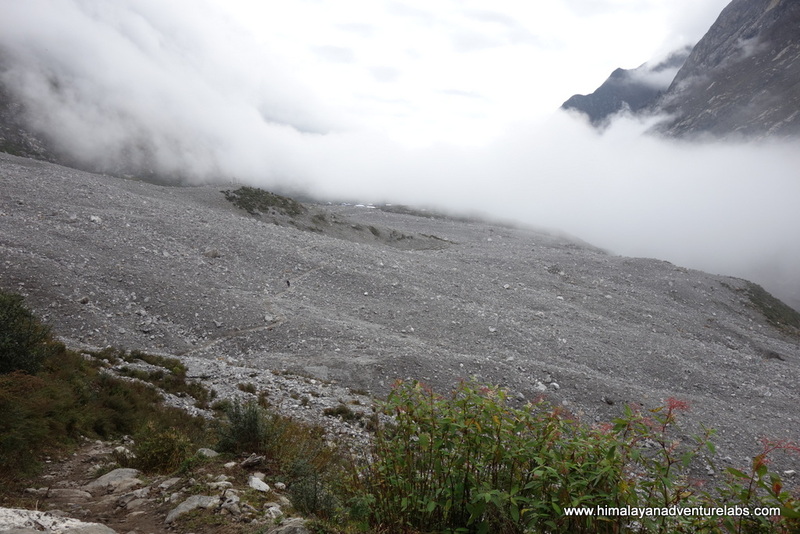 We had five days to reach the Langtang Valley and return on foot, our route tracing a lollipop shape. The crux of our journey would be crossing the remote Kanja Pass, measuring in at a lofty 5,130 meters (16,830 feet). We told ourselves that if we pushed hard out of Kathmandu and kept a good pace through the foothills, we might be able to reach the base of the pass late the first night and then cross it at first light. We didn’t realize how poorly we had underestimated the journey and the tail end of the monsoon rains, we didn’t know it would take three days to even get to the base of the pass. There was a lot we didn’t know. But we were not entirely foolish. Last year we managed to set the fastest known time on the Manaslu circuit and we learned some valuable lessons. The memories were still fresh, crossing Larkka pass in the snow and ice, shivering in our sneakers and light layers. We knew then that our margin of safety was razor thin and vowed not to take so many chances on a future adventure. So the night before heading to Langtang we debated what gear to bring with us. In the end we added warm layers, a double wide sleeping bag, and a tarp shelter system. We packed twice the weight as the previous year but our hubris still won and we didn’t lower our expectations of speed. We scribbled down distances on the map but our measurements were rough and we paid little attention to the most crucial metric – elevation gain. Instead we adopted a laissez-faire attitude, ‘it is what it is’. 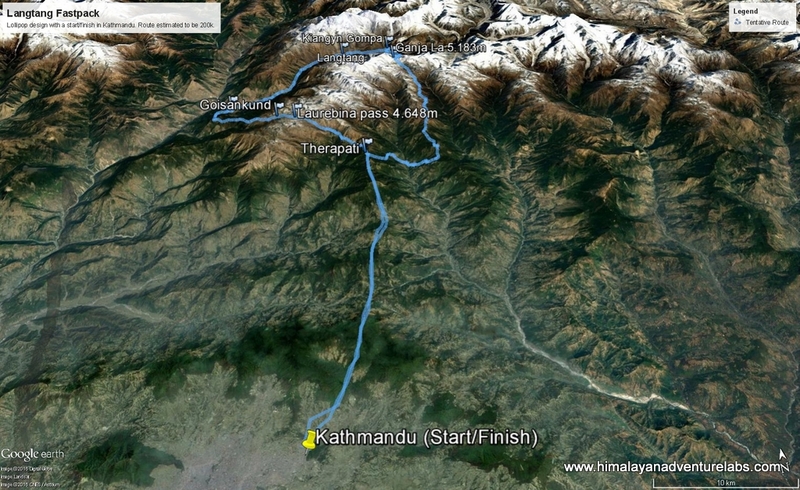 We would push continuously with small ‘micro-breaks’ and try to blast around a route that was truly Himalayan in size. 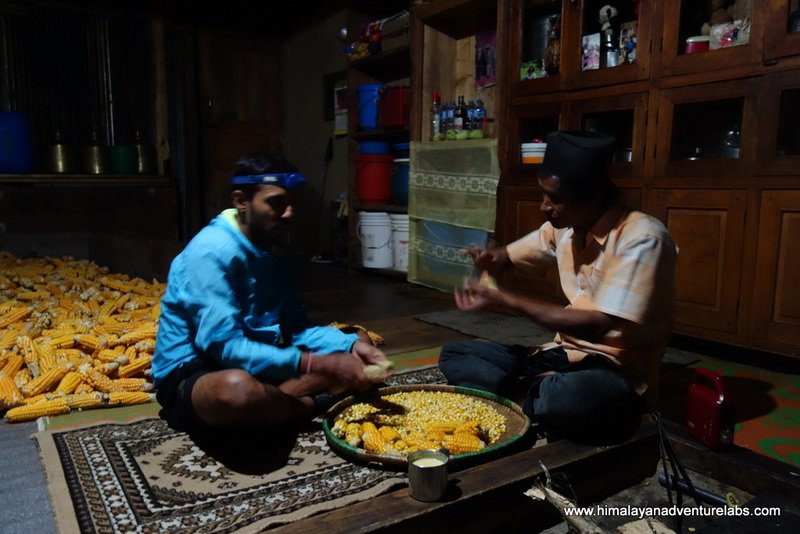 We lasted about 18 hours before our first true break, stumbling into a small tea house and finding the owner seated on the floor removing the kernels from a small mountain of dried corn. Hot lentils and rice sat on his wood stove and we ate heartily with plans to continue on into the night. And we did that, but a few hours around midnight fatigue hit us hard in the midst of a 1000 meter climb. We were miles from where we expected to be and it was starting to rain. Passing a lodge we rationalized that it made sense to go in and sleep for 3 hours – and that is what we did. We woke to an alarm and listened to the rain pound down on the tin roof above us. We didn’t talk but reset the alarm again and again, finally leaving in light rain and a murky light around 7am. That second day soon brought us to the start of our huge loop, we left the Helambu trail and quickly lost almost 2,000 meters of hard gained elevation. Down down down we went until we finally reached the river at the floor of the valley, we spent the next couple hours climbing with each step getting harder and harder. Passing through a small village we found one rustic tea-house and ordered some instant noodles. A few more questions and smiles and we had an empty mountain dew bottle filled with local moonshine and then we started climbing again. Dark clouds hovered ominously above us, ready to open their spigots. We had a six thousand feet of vertical to gain before the trail leveled out (for a while). Our psychological approach was denial, declaring it ‘party time’, high-fiving, hooting and hollering, and doing little dances. Anything to keep spirits up. So we made it a party and started doing shots of moonshine out of the old mountain dew bottle. An hour or so into this, before we had a chance to get seriously drunk, the sky decided to remind us that the monsoon was far from over. 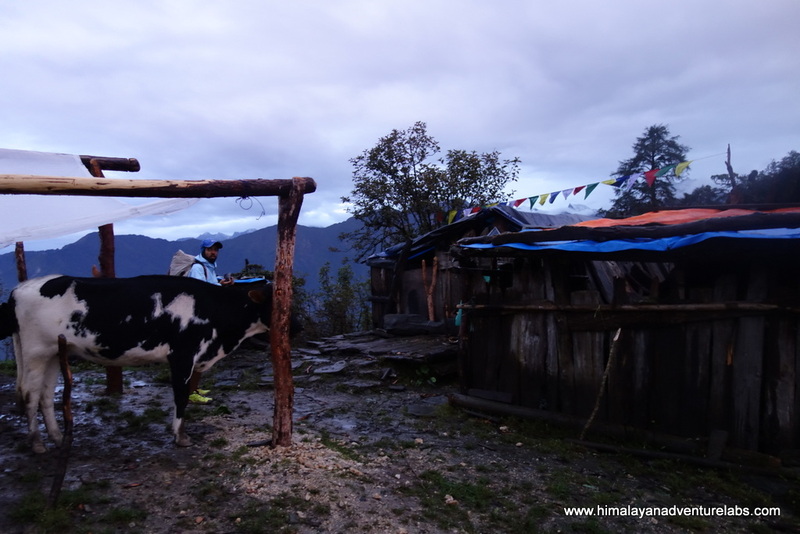 Amidst the pelting rain and the darkness, our headlamps illuminated a shack and we ran to it, finding shelter with some cows under tarps that were attached to the side of the shack. After a few minutes we explored the outside of the shack and finding a crud door we made our way inside. An earthen floor, smoldering fire, and a small area with three baby calves greeted us. No owner was in sight. We spread out our tarp and the unzipped sleeping bag and bedded down. Sometime later the owner and his friend came in, nonplussed to find us inside. 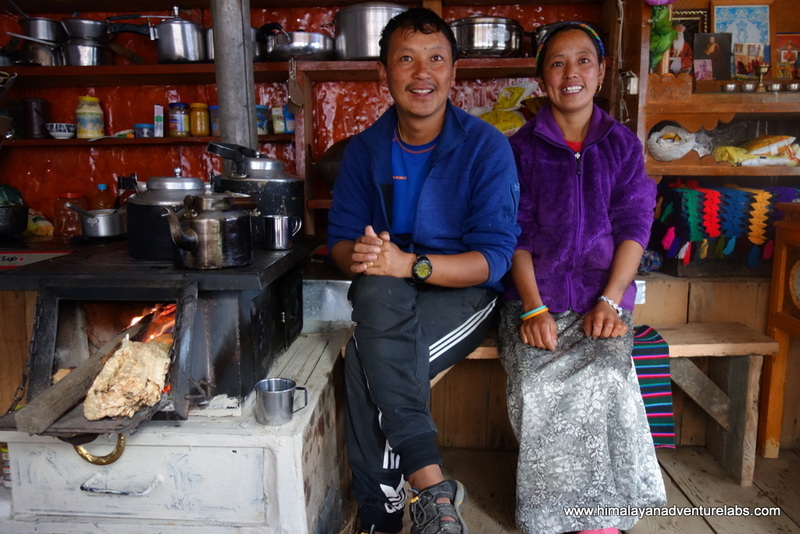 Sudeep chatted with them for a few minutes and the owner said crossing the pass in one day was possible but that it would be a very long days travel from his home. We dozed off – waking at dawn to the last of the rain. I left 500 rupees on a shelf and we slipped out into the early morning for our third day in the mountains. The third day was my favorite – we walked through amazing Rhododendron forests and finally climbed above treeline into tundra. A great deal of work had been done on the trail earlier in the year and even landslides had carefully constructed paths across them. How long they will last, I don’t know. Look at those trees! 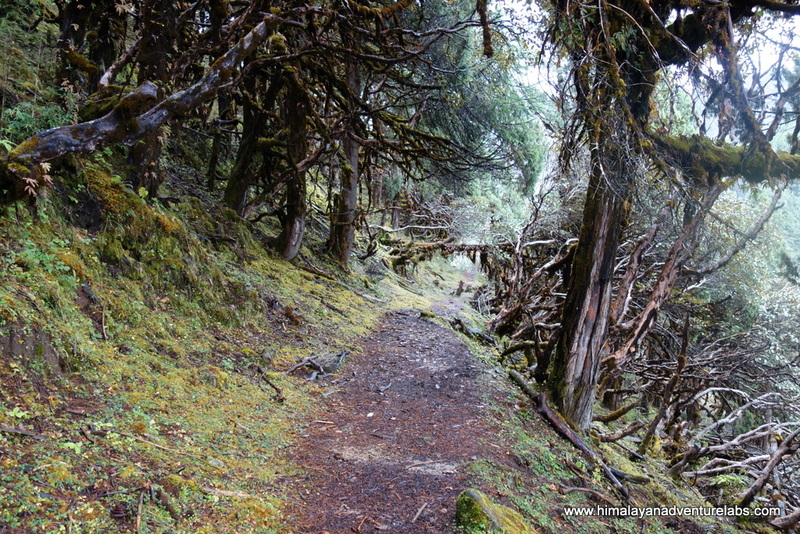 Somewhere around 3,000m I am usually reminded of the woods in the pacific northwest. We walked through much of the third day with trepidation. The fact that we were almost two days behind schedule weighed heavily on our mind. We knew that even if we made it over the pass, we would barely have enough time to traverse the Langtang Valley and catch a jeep ride back to Kathmandu – our original plan to return on foot was now scuttled.Options for camping near the pass were unclear and with the heavy rains during the previous two nights we were nervous about being out in the open with just a tarp. Mid-afternoon we found an abandoned yak herder shelter and we called it quits. We tried without success to start a fire in the wet hearth, split a can of sardines, and slept fitfully. We had no problems the next morning, after a couple hours we crossed a large drainage, realizing belatedly it offered excellent camping. From there we started climbing in earnest – gentle switchbacks took us up 800 meters to a nice plateau before the pass and then the trail disappeared. Ahead of us was a steep slope of loose rock that disappeared into the mist. Based on our altimeters, we knew we only had a couple hundred vertical meters to scramble but each step threatened to dislodge a landslide of rock. >We spread out and moved slowly. The few descriptions we had found talked about people getting lost and dying on the pass. 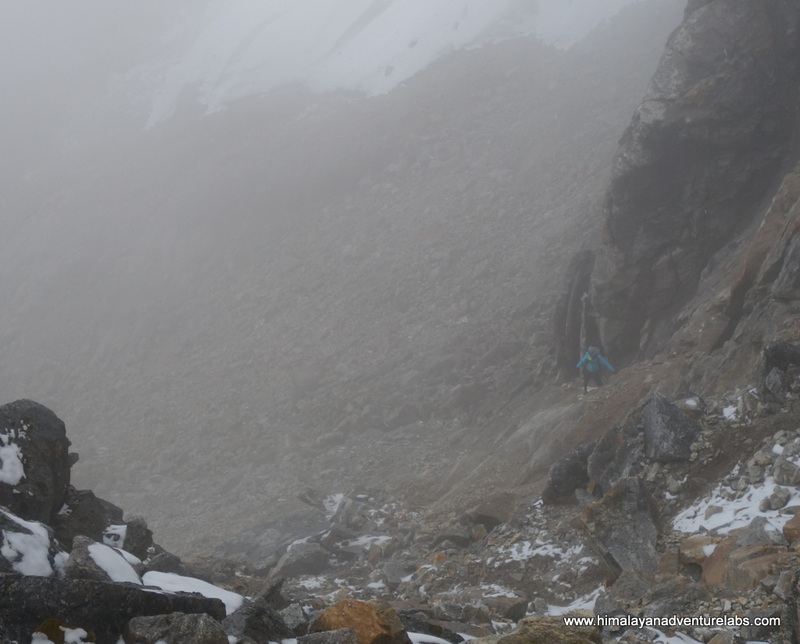 We were fortunate to have GPS tracks that we could follow; they gave us a good idea of where the pass was in the mist. The terrain got steeper and steeper to the point where we were using our hands as well. 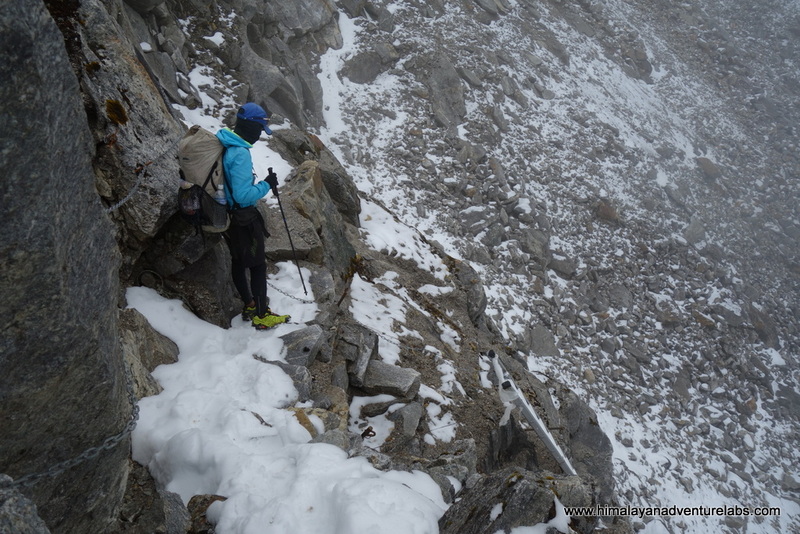 The last 50 meters were snow covered and then we were there – standing on the pass, all of five feet wide! An infamous quote from the climber Ed Visteurs is ‘Getting to the top is optional, getting down is mandatory’. 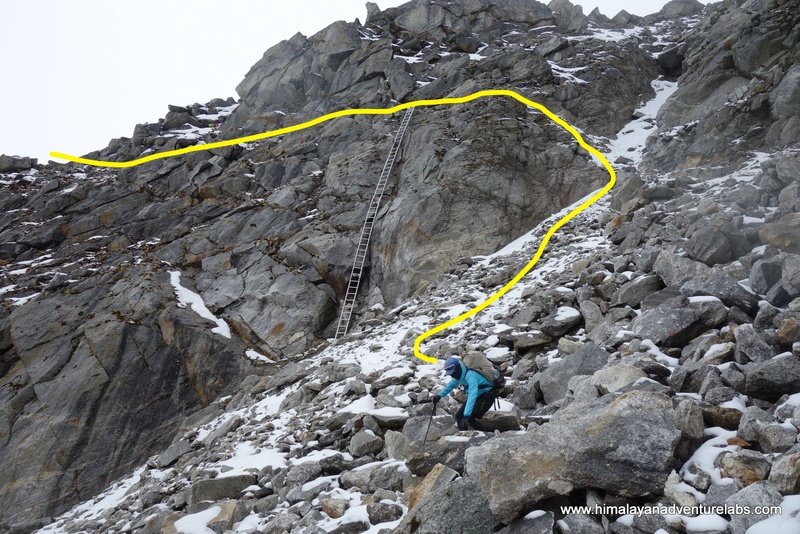 We were lucky to find some chains installed on the narrow catwalk on the opposite side of the pass. We eventually made it down only to find a very long traverse on slippery rock. There were no cairns to mark the way – instead we followed the drainage and occasionally checked GPS tracks. The going was slow and painful. How we got down the north side.. The next morning, day 5, well fed and rested we were finally able to run. 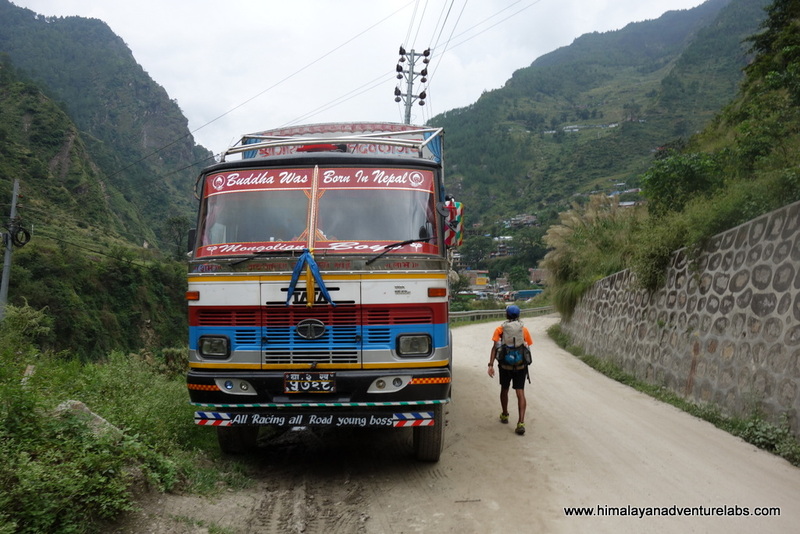 And we did – all the way down the Langtang Valley to the road head at Syrabu Besi. The most somber part being a half mile crossing of Langtang Village, now buried from earthquake debris. Fond memories of passing through this village during our Great Himalayan Traverse in 2014 were tempered by debris in every direction and the trees on the opposite side of the mountain leveled and snapped like matchsticks. Looking back after we crossed. No words. Looking back after we crossed. No words. We eventually moved on and passed through many other villages which thankfully escaped the wrath of the earthquake. The Langtang Valley, despite the destruction in the upper reaches, has so many beautiful sections of trail and we were finally able to run. We reached the road head late in the day and found a hotel. Shortly after that we found ourselves in the middle of a drunken brawl on the street and shortly after that we found ourselves barricaded in our hotel room with the lights out and the curtains drawn. But that is another story. The next day found us safely back in Kathmandu. We are planning a return to Langtang. In April we hope to complete the entire lollipop route in 10 days, filling in the missing section travelling through Gosaikund and the sacred lakes. If you are interested in a serious adventure, I hope you will join us! 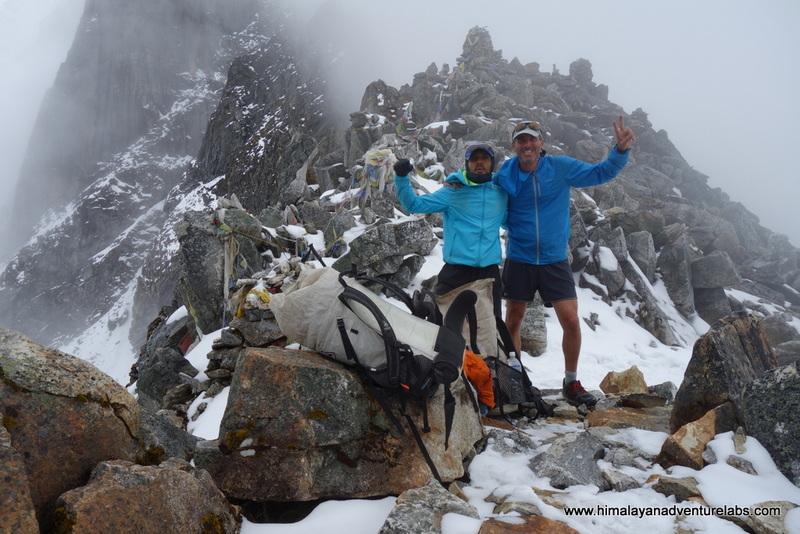 Much thanks to Sudeep for joining me on another crazy adventure and to Michael Collin for posting his trip report on Kanja La and sharing his GPS tracks with us. And thanks to the people we met along the way. Please see our site www.himalayanadventurelabs.com for full GPS tracks and/or to learn how join us in 2017. Here is the complete photo album from this trip! We made it! Kanja La 5,130m/16,830ft. Wahoo! We think we might be the first people to reach it this year from the South. Now how do you get down? We made it! Kanja La 5,130m/16,830ft. Wahoo! We think we might be the first people to reach it this year from the South. Now how do you get down?